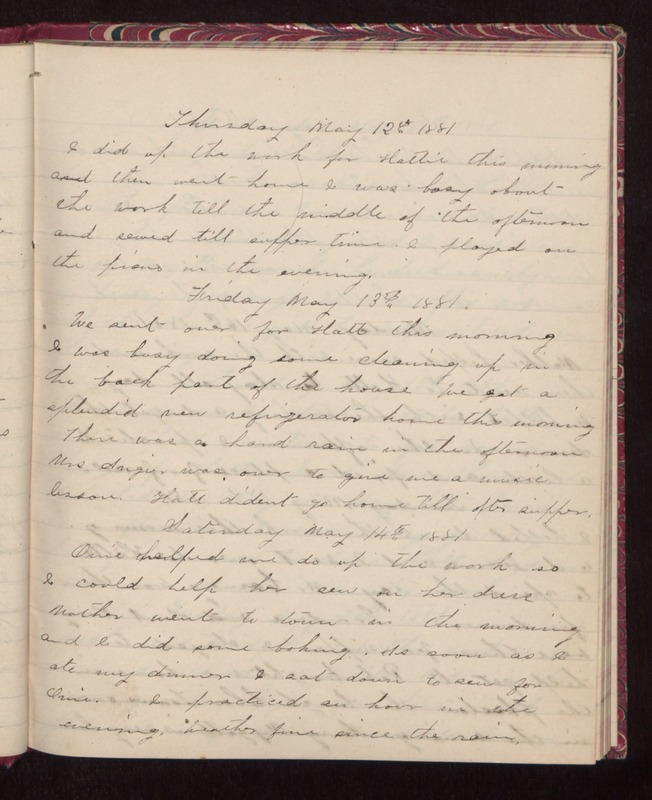 Thursday May 12th 1881 I did up the work for Hattie this morning and then went home. I was busy about the work till the middle of the afternoon and sewed till supper time. I played on the piano in the evening. Friday May 13th 1881. We sent over for Hatt this morning. I was busy doing some cleaning up in the back part of the house. We got a splendid new refrigerator home this morning. There was a hard rain in the afternoon. Mrs Angier was over to give me a music lesson. Hatt dident go home till after supper. Saturday May 14th 1881 Orrie helped me do up the work so I could help her sew on her dress. Mother went to town in the morning and I did some baking. As soon as I ate my dinner I sat down to sew for Orrie. I practiced an hour in the evening. Weather fine since the rain.